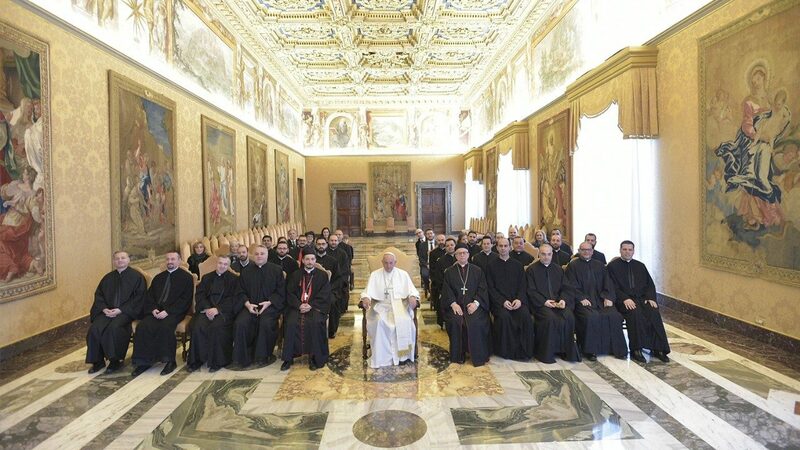 Pope Francis on February 16, 2018, shared his wishes for peace and young people in an address in the Consistory Hall of the Apostolic Palace, where he received the Community of the Pontifical Maronite College in Rome, on the tenth anniversary of the approval of the new Statute of the College. I greet you with affection and am glad to welcome you. This year will be the tenth anniversary of the approval of the new Statute of your College. It is an opportunity not only to meet but also to commemorate your history and to explore your roots. In reality, this time you spend in Rome is a time to consolidate your roots. I think of the roots present in the very name of your Church, which refers to Saint Maron – you celebrated him a few days ago – and along with him, to monasticism, that form of life that is not satisfied with a moderate and discreet faith, but feels the need to go beyond, to love with all the heart. Poor lives in the eyes of the world, but precious for God and for others. It is by drawing from these pure wellsprings that your ministry will be good water for those who thirst today. Our heart, like a compass, seeks to orient itself and is drawn towards what it loves; “For where your treasure is, there your heart will be also” (Mt 6: 21), says Jesus. You, in these years, helped by spiritual formation, by study, by community life, have the grace of orienting your heart well, so that it may find the zeal of your great fathers and mothers in faith. There is, however, the risk, today, of being absorbed by the culture of the temporary and of appearances. These years are an opportunity for developing antibodies against worldliness and mediocrity. They are years of exercise in the “Roman gym” where, with the help of God and of those who accompany you on your journey, you will be able to consolidate your foundations: first and foremost, those of an indispensable spiritual discipline, which is based on the pillars of prayer and inner labor. A liturgical and personal prayer in which rites are not enough, but which leads to life before the Lord, and the Lord within life. A patient inner labor that, open to exchange, helped by study and tempered by effort, operates a discernment that recognizes the temptations and unmasks falsehoods, to live the ministry in the greatest freedom, without duplicity, without pretense. The human, intellectual and spiritual enrichment your receive in these years is not an award for you, and far less a commodity to be exploited for one’s own career, but rather a treasure destined for the faithful who await you in your Eparchies and to whom your life awaits to be donated. Because you will not be called to exercise, even well, an office – it is not enough! – but rather to live a mission, without sparing yourselves, without calculations, without limits of availability. You yourselves will need to listen to people: indeed, God will confirm you through their lives, through many encounters, through His unexpected surprises. And you, as pastors in close contact with the flock, will savor the most genuine joy when you stoop to them, making their joys and sufferings your own, and when at the end of the day you are able to recount to the Lord the love you have received and given. You are called to live all this in a time that is not without sufferings and dangers but also filled with hope. The people who will be entrusted to you, disoriented by the instability that unfortunately continues to have repercussions on the Middle East, will seek in you pastors who console them: pastors with the word of Jesus on their lips, with hands ready to dry their tears and to caress suffering countenances; pastors who forget themselves and their own interests; pastors who are never discouraged, because every day they draw from the Eucharistic bread the sweet strength of love that satiates; pastors who are not afraid to be “eaten up” by the people, like good bread offered to brothers. Faced with the many needs that await you, the temptation can come to act in the way of the world, seeking out those who are strong rather than those who are weak, looking to those who have means rather than those who lack them. But when this temptation comes, it is necessary to return immediately to the roots, to Jesus who refused success, glory, and money, because the only treasure that oriented His life was the will of the Father: announcing salvation to all peoples, proclaiming God’s mercy with His life. This changes history. And it all begins with not losing sight of Jesus, of looking at Him as Saint Maron, Saint Charbel, Saint Rafqa and many other of your “heroes of sainthood”. They are the models to imitate to repel the temptations of careerism, power, and clericalism. The course that honors Christian life is not ascent towards prizes and the rewarding certainties of the world, but the humble descent in service. It is the road of Jesus: there is no other. I would still like to share two wishes with you, thinking of your precious ministry. The first: peace. Today fraternity and integration represent urgent challenges, that can no longer be postponed, and in this regard, Lebanon has not only something to say but also a special vocation of peace to be accomplished in the world. Among the sons of your land, you, in a special way, will be called to serve all as brothers, firstly by sensing that you are all brothers. Helped by your knowledge, work to ensure that Lebanon can always correspond “to its vocation of being light for the peoples of the region and a sign of the peace that comes from God” (John Paul II, Post-Synodal Apostolic Exhortation A New Hope for Lebanon, 125). The second desire concerns young people. As a Church we wish increasingly to have them at heart, accompany them with trust and patience, dedicating time to them and listening to them. Young people are the promise of the future, the most serious investment for your ministry. Pope Benedict, meeting them, said: “Young people from Lebanon, be welcoming and open, as Christ asks you and how your country teaches you” (Meeting with young people, 15 September 2012). Yours is the mission of helping them open their hearts to good, so that they may experience the joy of welcoming the Lord in their lives. Dear brothers, I thank you for your presence and, as I entrust you to the protection of Our Lady of Lebanon and your great Saints, I give you my blessing and I ask you to remember me in prayer. Thank you! Santa Marta: Pope Says No Fake Fasting!